I only had one spare afternoon this week so I shot down to the No.8 marker buoy for a quick set. While the longline was down I caught a gurnard and kahawhai on the rod. I make flasher rigs for the rod using target hooks for trace security. On the longline were another 2 kahawhai (one was huge) and 2 gurnard. 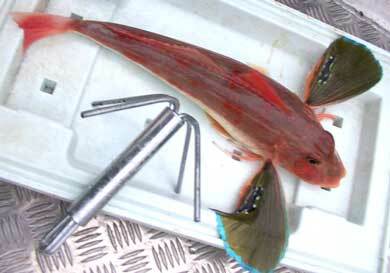 The larger gurnard was 47cm long and weighed in at 3lb. This is my biggest yet (photo above). It rained and a 4 metre tide was ripping out during my fishing, not ideal conditions. Geoff phoned in a report last night on his recent fishing trips over the last week at Mokau Beach. Geoff and a couple of fishing mates have been hauling in huge snapper this week. On Wednesday Geoff's biggest snapper weighed in at a staggering 12.2kg and measured exactly one metre long. The big fish was taken on squid legs used for bait. According to Geoff this huge snapper was hauled in on the last day of the local competition which once again gave him first prize for the biggest snapper of the month. Wednesdays total catch between the three of them was 14 snapper, 7 of which were over 10lb, and 30 very large gurnard. Just yesterday Geoff caught another good snapper which weighed 6.2kg. Geoff reported that the easterlies have been ideal for kitefishing at Mokau, there has been no sign of sharks, and the seas have been dead flat. Geoff promises a full report with photos will be coming soon. Last Tuesday Rick spent the day fishing his kite powered dropper rig at Muriwai Beach. Using mullet and kahawai for bait Rick caught two snapper which weighed 1kg and 3kg, 8 gurnard, 2 kahawai and one 22kg bronze whaler shark which had four or five gurnard heads in its gut, probably as the result of raiding Rick's, or some other unfortunate kitefishers rig. Heaps of kitefishers fished this weeks easterlies with several taking good hauls of snapper, gurnard and trevally from Muriwai beach. A report of a line full of trevally taken from Kariotahi Beach was unusual as normally kitefishers only get one or two for the day. We fished with a submarine and had two sets each day on the July 22 and 24 of July with 14 hooks on each set. The torpedo was set over the high tide and the sets were not quite straight out. We were using longlife salted squid and bonito on alternate hooks. We tied the bonito to the hooks. The gear was left set for 40 minutes each time. The majority of the baits came back untouched and no fish were caught. Next Meeting: Tuesday 5th August 7.30pm Manukau Cruising Club. Joe Renata from Anton's Seafood will be our guest speaker. Joe will demonstrate fish filleting techniques on snapper, kahawai and gurnard. Don't miss this chance to come along and sharpen up your fish filleting skills. The resulting fillets will be raffled at the end of the night. We saw a welcome return of Bruce Riley, one of our more colourful characters we've had as Guest Speaker. His presentation style was riveting and very informative. Salt-Water Fly Fishing has taken a long time to get established in NZ yet has many advantages over jigging. If a snapper is going to eat a piece of chromium-plated lead, he is going to be suicidal over a fly that imitates a whitebait or the like. His budgie gave up its tail feathers in the pursuit of a good salt-water fly. Bruce recommended Black Magic Snapper Snatchers as a quality fly that is designed to have a small piece of bait. He suggested one for every second hook for Kite Fishing. One of the most important things needed for success is good berley. He recommended berley pellets soaked overnight in fish oil. We hope to have Bruce back to show us how to tie our own flies, maybe with some knot tying where he would bring a tester that can test line and knot strength. Being a good Kite Fishing Club member I observed the club fishing day today by going fishing! Unfortunately it was not a resounding success. I set 5 hooks and caught four sharks and lost the other trace. Rather than continue feeding and losing gear to sharks, I gave up. Chatting to another fisho out there (catching sharks with a surf caster for sport) there's nothing but sharks out there at this time of year. November to April will apparently provide elephant fish, kahawai and rig as far as good eating fish go. The photo below shows the type of shingle beach we have here, approx 10 minutes drive away. Our monthly Club Fishing Day in June was held at Muriwai. Harsh conditions comprising a northerly wind, southerly rip and very heavy rain made fishing difficult. Tony caught a 1.2kg snapper and this was all anyone caught. So the club day competition silver pin goes to Tony Talbot. Noel Thomas commented on the difficulty of using a bottom longline that day under those conditions. He said he walked his kite and line one kilometre up the beach from his reel in an effort to counter the rip. He sent the kite out and proceeded back to the spool. Ten minutes later, back at the reel, the line had overtaken him as the current was carrying it down the beach. The kite was no longer going out to sea, instead it was being dragged back in, such was the strength of the rip. Tony fared better with his dropper rig, yet there was a murmur that the snapper he caught must have been a bit under the weather. Robbie and Kathy Cullen have very kindly offered the use of their home for the club weekend away on the 6th and 7th of September. There will be prizes for the biggest snapper, gurnard and kahawai on each day. There will also be prizes for the biggest non-scale fish and the most unusual catch for the weekend. Each day will also have a prize for a mystery weight. David Billings may have to give up his title as 'Club Idiot', which he was awarded for his antics with some chillied mussels. Future candidates for this title needn't apply in writing, just turn up for the weekend and pit your wits against the club's finest. Our annual Inventors Night will be held as part of our October meeting. Put your thinking caps on and come prepared for an evening which has proven in the past to be one that inspires innovation and competition.